I’m a pantser rather than a plotter. This means that sometimes I truly have no idea what’s going to happen until it does. I write scenes as they come to me, and generally get a draft out quickly. Because of this I need an app that doesn’t mean that I’m cutting and pasting whole rafts of words through larger rafts of words. I need this. I set myself an imposed deadline and tend to stick to it. I pop this into the targets, decide how many days a week I’m going to write, and hey presto I have a daily word count. The little line graph starts off red, moves to amber, and becomes greener as you get closer to achieving your daily target. You can even set it to alert you along the way. I allocate each chapter a new folder, and then add sub-folders for each new scene. I label the folders with a sentence that tells me what that chapter is about, and each scene gets a few descriptive words too. As I said, I tend to write in scenes. Scrivener allows you to pop a synopsis of each scene, sort of like a post it sticker. This means that when I’m looking for something, a passage, whatever, I can just browse the synopsis. In Scrivener, this is available in a corkboard view, document view or outline view. More importantly, you can drag scenes, and chapters around- before or after other scenes. There’s no cutting and pasting, no risking losing chunks of words. You can even drag scenes down to a deleted scenes folder at the bottom of the page, so you can easily retrieve it if you change your mind later. Aside from the project total, Scrivener also keeps track of the words per scene. I don’t like my scenes to drag on too long, so this helps me work out where some trimming is required. Apparently in The Luminaries, Eleanor Catton decreases her chapter length in proportion to the previous so that it spirals into an ending. It’s supposed to mimic the waning cycle of the Moon. The astrologer in me can appreciate it, the commitment-phobe in me hasn’t yet committed to reading it. 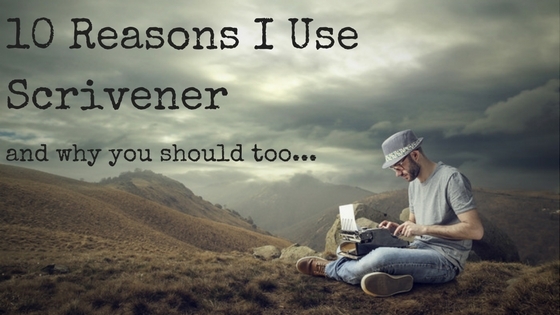 Having said that, Scrivener would be good for that. Ever had to trawl through thousands of words trying to remember what you named the best friend’s husband? How old her kids are? Their names? Don’t stress it. There’s a handy little character section especially for that. I sometimes find a celebrity who I think could look like my character and attach that image. I’ll also attach images of outfits that they might wear to work, or coffee, or on a date. It’s almost like having a pinboard. I use this space to write any backstory that I need to write, and to keep track of things like goals, motivations and conflicts. Similar to character settings, I find it helpful to pop in a pic or two, as well as some descriptive words. If there’s any history that can help me with backstory, it goes in here too. This is a new discovery for me. I Want You Back is an ensemble cast and is written in three different points of view. Colour coding allows me to see at a glance who is saying what. I also used this when I was editing Big Girls Don’t Cry to indicate which scenes still needed work. There’s a whole folder where you can store your research. Cut and paste directly into it, or write back stories to your hearts content. It’s all here, all handy. I prefer to call this folder my “out-takes”…the words that when they first came out of my brain seemed so clever, but in the context of an actual story, are a tad too contrived. I save them down here. Just in case. Then when you’re done, the whole thing compiles into a word doc (or pdf or whatever) at the touch of a command. Scrivener isn’t just for novels- there’s a format for all types of long form non-fiction as well. I use Scrivener for mac (purchased through the app store), but there’s also a version for windows users. Google it.